Adam and I have been really lucky when it comes to enjoying great weather while traveling. From a cloudless day high atop Borobudur in Indonesia to an unbeatable blue sky in Cinque Terre to an incredible sun halo in Antarctica, we’ve seen far more sunshine than rain clouds over the course of the last few years. With just a few exceptions, good weather seems to follow us. 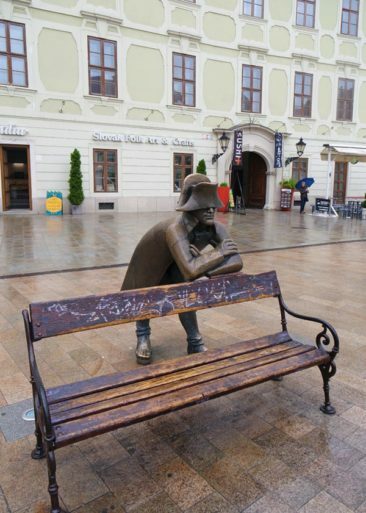 Cumil- our favorite of the Bratislava statues! Bratislava was one of those exceptions. 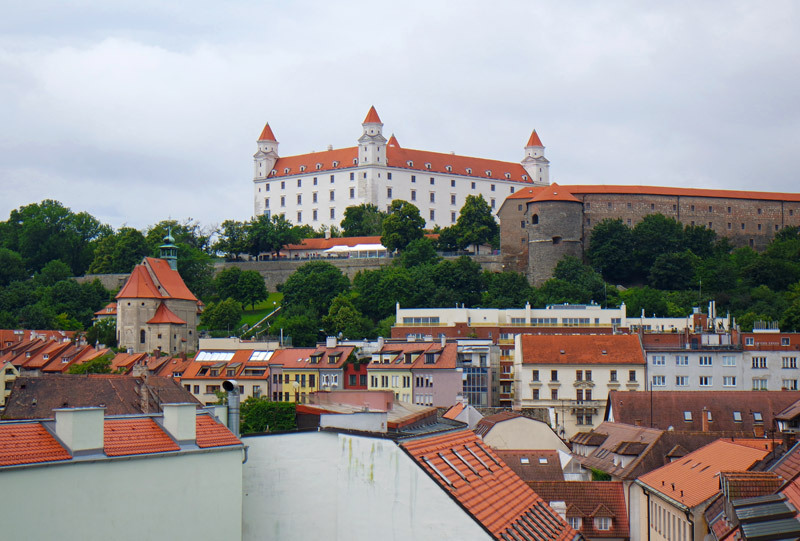 Bratislava, the capital of Slovakia, represented a self-imposed layover as we explored a few Eastern European capitals during a wonderful week’s vacation. 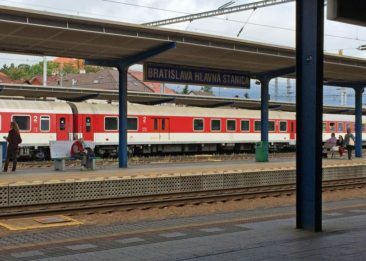 We took an early train from Vienna with the goal of spending most of the day sightseeing before boarding another train bound for Budapest. 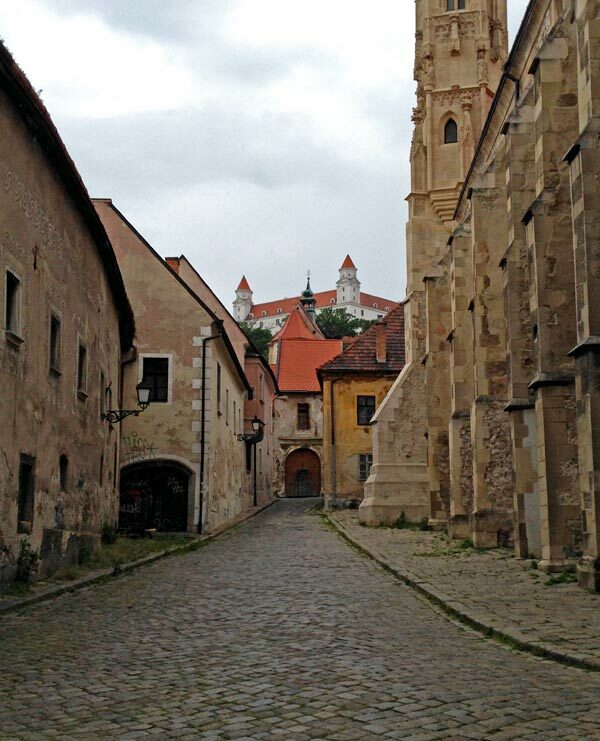 After a few gorgeous days in Prague and Vienna, we were disappointed to arrive in Bratislava as rain started to fall. It was a quiet morning, and the crowds dispersed quickly as we stood with our luggage in the middle of the Soviet-style train station. We spent a few moments looking for luggage lockers, only to find lockers were nonexistent. Instead, a grumpy, unkept gentleman behind a desk offered to watch our suitcases until our next train departed. “For fee,” he grunted, tapping a finger against a sign that listed the prices. With no other choice (dragging suitcases in the sun would have been unpleasant, but in the rain it was unimaginable) we deposited our luggage behind the desk and decided to make the most of our visit. 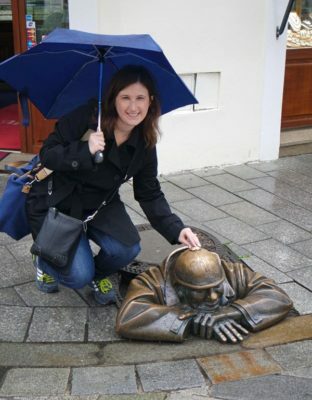 Our day in Bratislava was punctuated by rain, clouds, and puddles, and we still talk about it as one of the most interesting short trips we have taken. 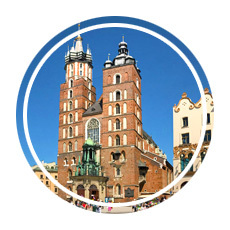 It doesn’t take long to get to know the historic city with an old town that dates back more than 1,000 years. Here are a few of the spots we visited that make a quick trip to Bratislava fun no matter what kind of weather you get! 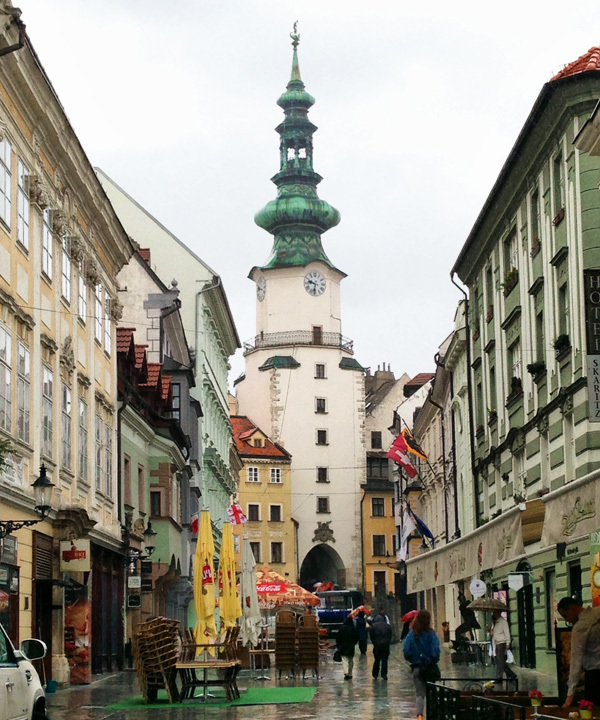 A visit to Bratislava is almost guaranteed to take you to the Old Town, which is home to historic buildings, great food, and plenty of quirky sightseeing. Most of our sightseeing took place in this area, as the rain limited some of the walking we planned to do. Even if you limit your visit to Old Town, as we did, you won’t be disappointed by the great selection of things to see and do. One of the oldest structures in Bratislava is St. Michael’s Gate, which has stood in place since the late 13th century and is one of the only gates that remains of the city’s medieval fortifications. 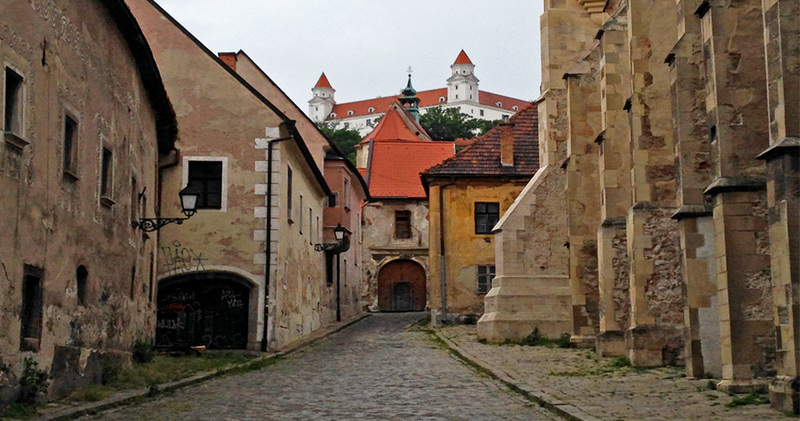 Like many cities in Eastern Europe, Bratislava was surrounded by city walls that provided protection for centuries. Eventually the city walls came down as the city grew beyond them, but the gate remains in place. Today, the Bratislava City Museum holds residence in the gate’s tower; the Museum of Arms and City Fortifications provides a history of Bratislava’s fortification as well as great views of the city. We thought the museum was well-curated (and it provided some much-needed shelter from the rain!). Also not to be missed is Kilometre Zero, which is a distance compass built into ground at the gate. Take a moment to find the city closest to your hometown and marvel at just how far your travels have taken you! There is more to the Bratislava City Museum than the Museum of Arms and City Fortifications. The Museum of the City History provides a nice perspective on life in Bratislava over the centuries. The museum has a surprising number of artifacts that are nicely organized. 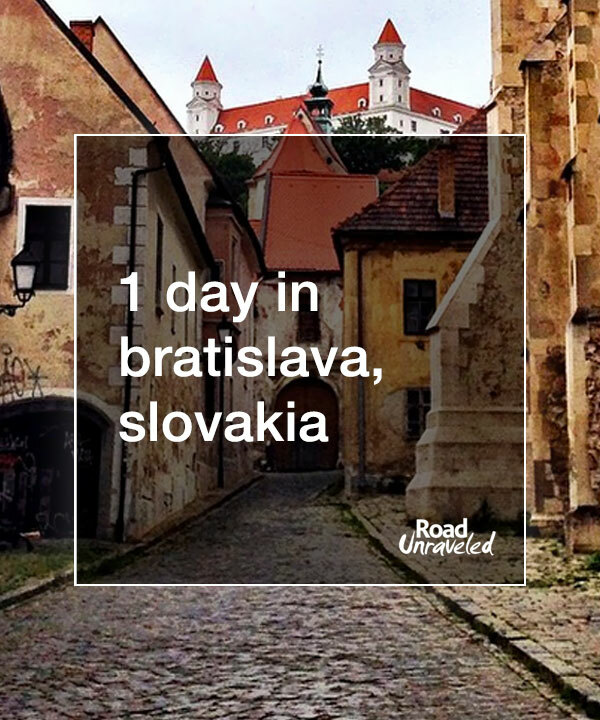 It’s a great way to learn about Bratislava if you are on a limited schedule. 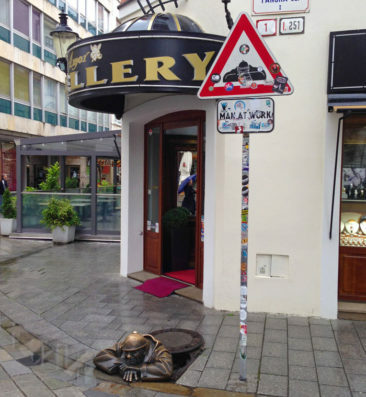 You can’t spend too much time walking through Bratislava’s streets before you’ll trip over a statue—perhaps literally! 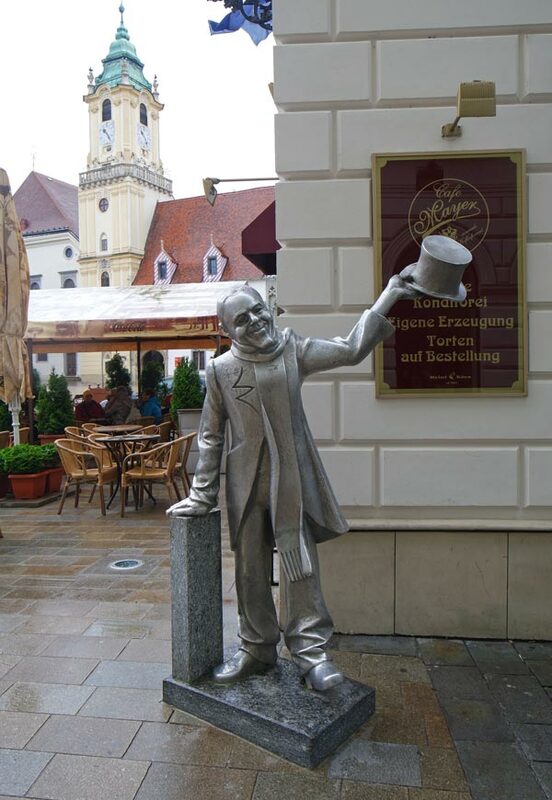 One of Bratislava’s quirky attractions is the collection of statues that reside around the city. They sit on benches, welcome you to the city, lurk around corners, and—in the case of the most famous statue—gaze up at you from underground. The most famous is Čumil, whose name translates to “The Watcher.” He is the statue of a worker who pokes his head out of a manhole cover and rests with his head on his hands. Some believe he represents a lazy Communist-era worker, some think he is a spy in disguise, and some think he likes to look up the dresses of women who pass by. Whichever story you prefer, he is the most photographed of Bratislava’s statues. We made friends with Hubert the Napoleonic soldier. We’re tight now. Hubert is another popular statue. Leaning against a bench, he’s an easy one to get a selfie with, and he also has a great story. 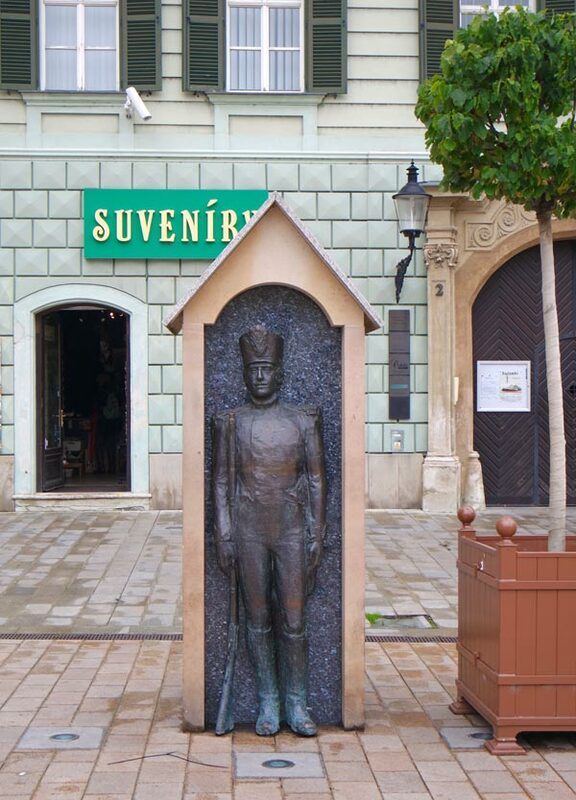 He depicts a Napoleonic soldier who visited Bratislava, met a girl, and decided to stay in the city to be with her. By the time we came across Hubert the rain had stopped, and we were glad to rest with him on his bench for a bit. Other statues, including a paparazzi photographer, a small man hiding in a hole above a doorway, a soldier standing next to a guard’s booth, and a man who waves his top hat in the air, famously dot the landscape and add character and fun to the city. 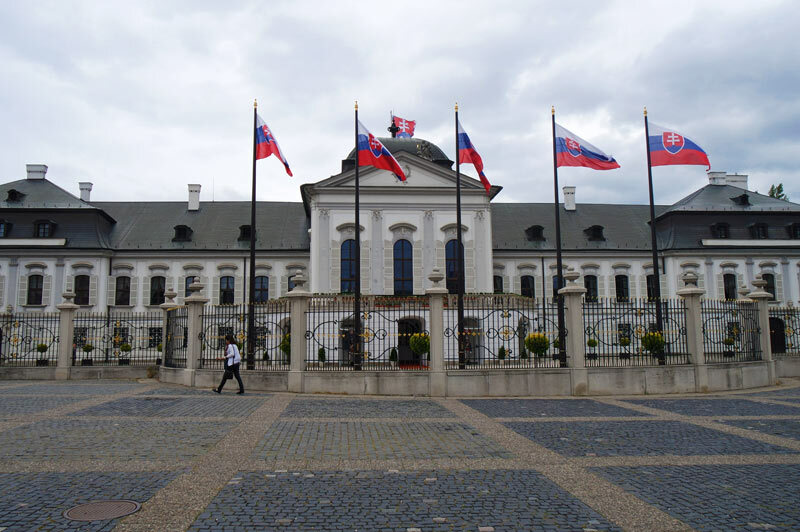 The first building of note that we saw during our walk from the train station to the Old Town was the Grassalkovich Palace, Bratislava’s presidential palace. In addition to having a nice public garden it is also possible to see the changing of the guard every hour. 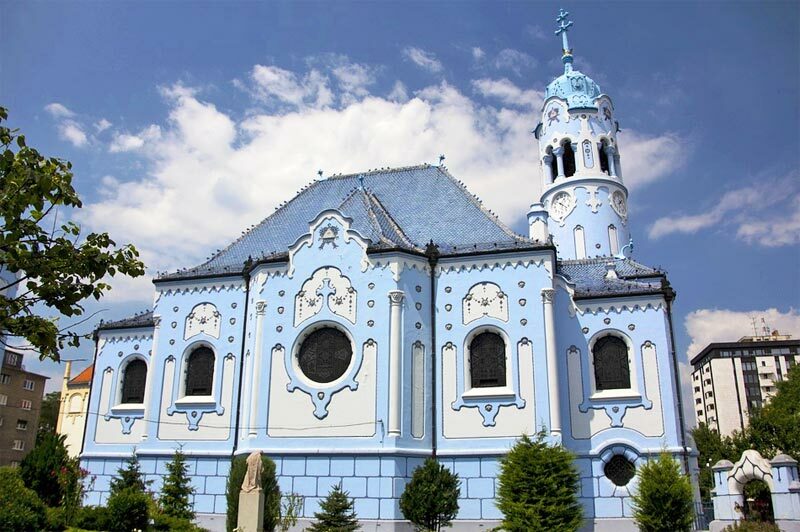 Public tours of the inside of Grassalkovich Palace are not available, but it’s still worth exploring the exterior and admiring the architecture. Be sure to stop and take a couple photos! 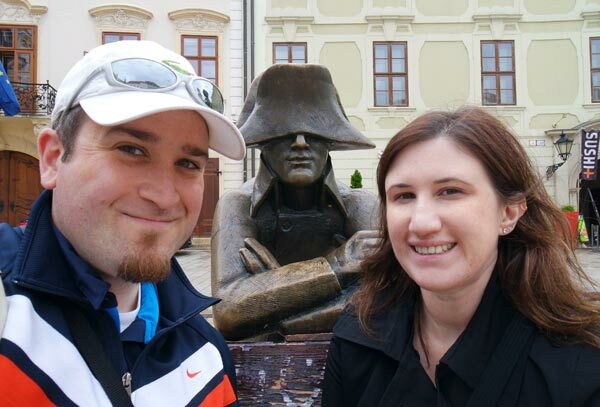 One of the best photo spots we found in Bratislava was near the Clarissine Church, a former Roman Catholic church. 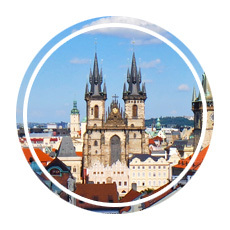 Established in 1297, the Clarissine Church is now used as a concert hall and event space. 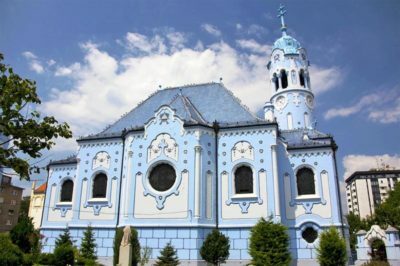 We came upon the church by accident and were both captivated by the Gothic structure and its impressive view of the Bratislava Castle in the distance. 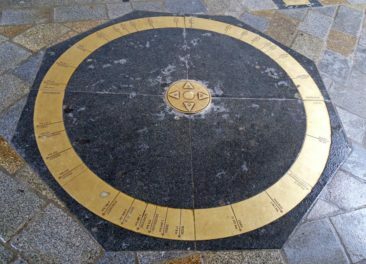 If you are looking for an Instagram-worthy location in Bratislava, this is a great spot to check out! The beautiful Primate’s Palace is a great stop for architecture and history lovers. The building is more than 200 years old, and its famous Hall of Mirrors witnessed the signing of the Treaty of Pressburg between Napoleon and Holy Roman Emperor Francis II. 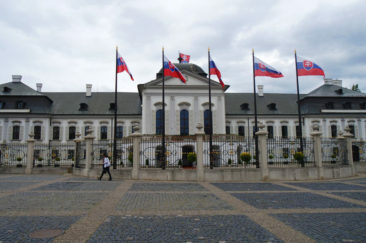 Today, it is open for tours and is where the mayor of Bratislava has offices. We didn’t have time to tour the interior of Primate’s Palace, but the exterior of the building was beautiful and we enjoyed learning about the history of the building. Our day of sightseeing in the rain made us hungry, so when the weather cleared up a bit we took up residence at a sidewalk table and enjoyed a leisurely lunch. I opted for a pork dish with cabbage and dumplings, and Adam ordered fish (which turned out to be a whole fish, much to his surprise). Both meals were really tasty, though, and combined with a glass of local beer (we chose Zlatý Bažant) we had a nice, local meal. 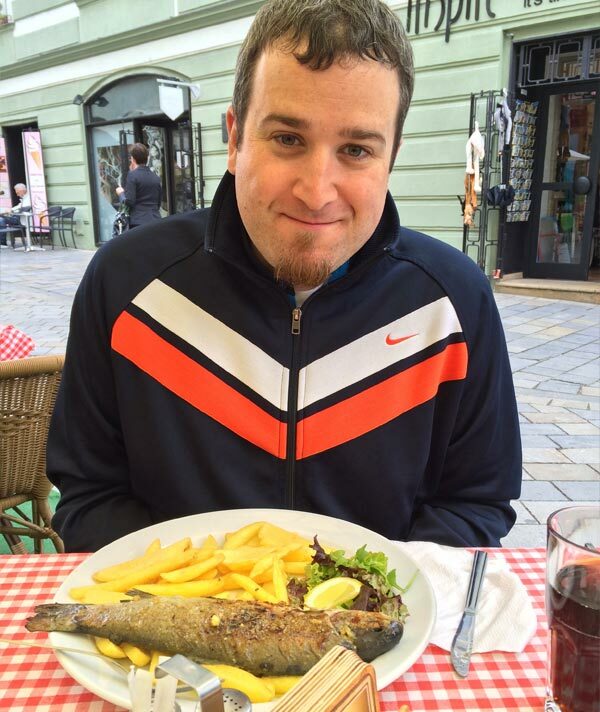 Slovakian cuisine is delicious, especially if you enjoy Eastern European food as much as we do, and even if you only have a few hours to explore Bratislava it is worth incorporating a meal into your schedule. 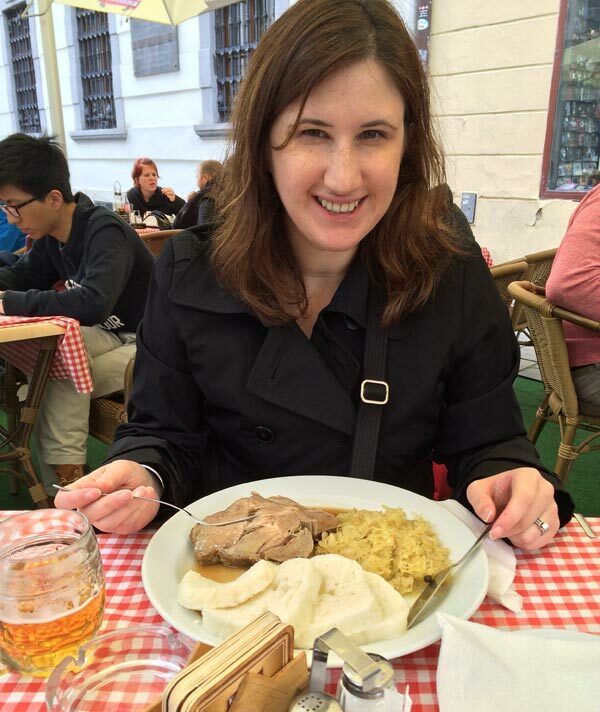 By the time we wandered through Old Town Bratislava, took photos, visited a few museums, and had lunch, it was time to return to the train station and retrieve our luggage (and to our surprise our suitcases were still there—as was the cranky man behind the left luggage counter!). 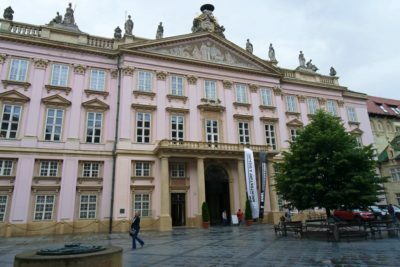 As with all great trips, we left with a few spots still on our list to explore the next time we pass through, including a full tour of Bratislava Castle, the Blue Church, Slavin (a historic cemetery that is also popular for having great panoramic views of Bratislava), and the Museum of Viticulture, a museum completely dedicated to Slovakian wine! We know there is a lot here, so we created a map that shows all the places we mentioned above. 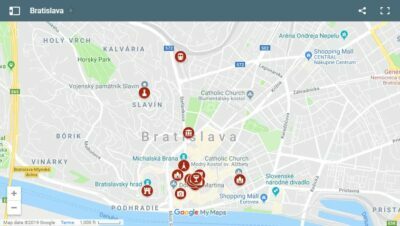 We hope this can help you plan your day exploring Old Town Bratislava! Plan Your Day in Bratislava! It seemed just a bit ironic that the sun started to shine as our train rolled out of the station and onward to Budapest. We spent our day in Bratislava dodging raindrops and doing our best to explore the city, and it ended up being interesting, educational, and a lot of fun. 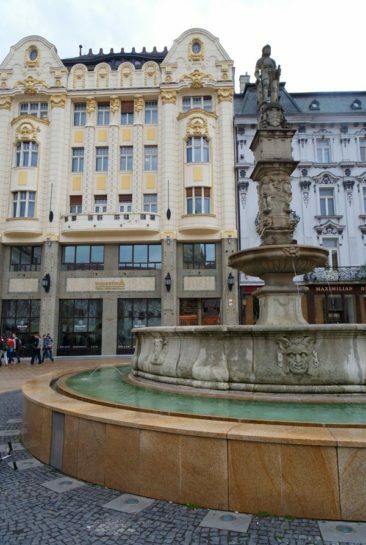 If your travels will take you through Bratislava, save at least a few hours to explore the Old Town and learn about Slovakia’s capital city. The next time we return we plan to spend more than a day there; there’s still so much more to see, and we’re hoping our next visit will be just as wonderful—and just a bit sunnier! 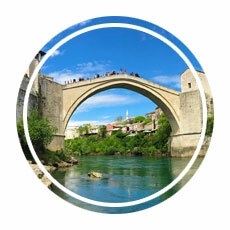 Are you planning a trip to Eastern Europe? 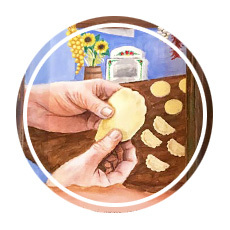 Here are a few additional posts about the region!